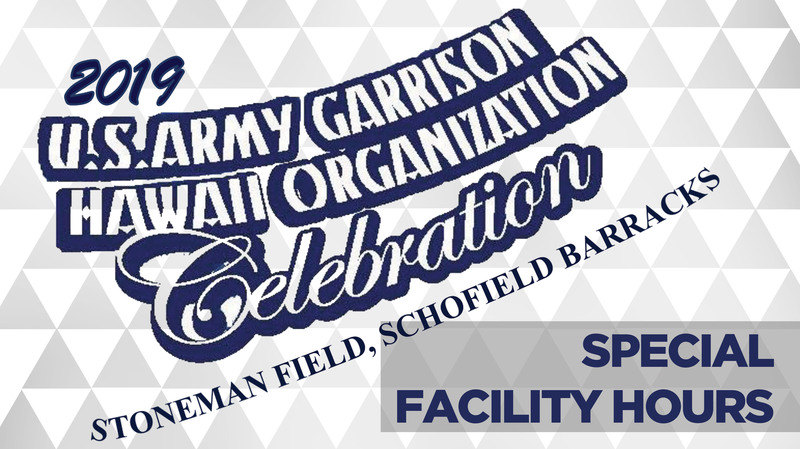 Several Family and MWR facilities will be closed or have altered hours on Friday, May 24, 2019 due to the Garrison Organization Celebration. We apologize for any inconvenience this may cause. Kolekole Bar & Grill (SB): 5:00 p.m. - 8:00 p.m.
AMR Physical Fitness Center: 5:45 a.m. - 9:00 a.m.
Fort Shafter Physical Fitness Center: 5:00 a.m. - 9:00 a.m.
HMR Physical Fitness Center: 5:45 a.m. - 9:00 a.m.
Health & Fitness Center (SB): 6:00 a.m. - 9:00 a.m.
Martinez Physical Fitness Center (SB): 5:00 a.m. - 9:00 a.m.
Tripler Physical Fitness Center: 5:00 a.m. - 9:00 a.m.
Wheeler Physical Fitness Center: 5:00 a.m. - 9:00 a.m.
Richardson Pool (SB): 6:00 a.m. - 9:00 a.m.
Tripler Pool: 6:00 a.m. - 9:00 a.m.
Fort Shafter Bowling Center: 5:00 p.m. - 12:00 a.m.
Schofield Bowling Center: 4:00 p.m. - 1:00 a.m. Tropics Recreation Center (SB): 4:00 p.m. - 12:00 a.m.
Army Community Service (SB): 7:30 a.m. - 9:30 a.m.
Community Recreation Division Administration: 7:30 a.m. - 9:30 a.m.
Sports Administration: 7:00 a.m. - 9:30 a.m.